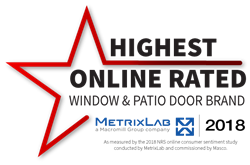 Milgard Windows & Doors was named the highest online rated window and patio door brand for the third straight year, demonstrating their continuing commitment to manufacturing quality products and delivering great customer experiences. “Throughout 2018, Milgard continued to be the industry leader in our program with the highest NRS score outperforming competitors for the third year in a row,” said Selin Varol, Research Manager at MetrixLab. Brand ratings are conducted by MetrixLab’s net reputation scoring system. A Net Reputation Score (NRS) is determined by looking at the online content posted by real customers. Millions of blogs, review sites and social media comments are evaluated to derive the score which is measured on a 200 point scale. Positive and negative engagement on product attributes and overall customer experience factors into calculating the digital health of a brand.